Pattern is from Knit Socks. 2 skeins of cascade 220 superwash, #3 bamboo dpns, one at a time, cuff-down. 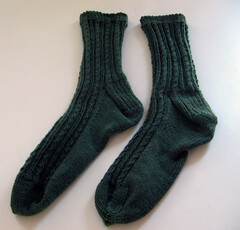 i followed the pattern as written, except that i reversed the direction of the mock cables for the second sock. these socks are a gift for a friend, men's size 10.5.